Christmas is less than 15 days away and I realized that I think I might be the only blogger not to have posted a wish list... shocking, I know! This certainly doesn't mean that I don't have one, I do, it's miles long, but this morning I took some time to pick 3 things I would really love that have been on my list for a while to share with you. 1. 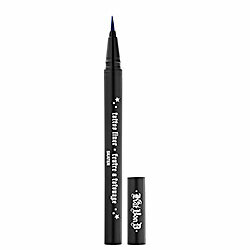 Kat Von D. tattoo eyeliner - which I heard nothing but amazing things about. I am pretty unsteady when it comes to doing liquid eyeliner on myself, and this one has a thin brush almost like a marker and it goes on full of colour. (If I do the line right the first time, I can't risk going over it again and ruining it, so this is super important for me ). The Kat Von D. collection is only available at Sephora in the UK, USA and Canada (It might be in other countries as well, but not in France where I am), so when I hope to score this when I am back in Canada next week! 2. Asos Curve Slash Neck Lace Dress - I love all the lace that is making an appearance this season, and am feeling left out with none of it in my closet. 3. 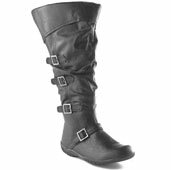 Black Leather boots - or in this case Evans, black leather-like boots with straps and buckles. It's so rare that I find a high wide calf boot that I really like and my last pair finally bit the dust a couple of weeks ago. I like these because they make me think of what a pirate meeting a steam punk would wear. I have been shopping like a madwoman for friends and family - and wish I could share what I bought with you, but then if they read my blog, all would be ruined. Hope everyone is out enjoying their weekend!